Home / Self improvement / Does eating bread make you gain weight? Eating bread has been getting a lot of heat lately. Does eating bread make you gain weight? The simple answer? Yes, it does. Originally, diets which eschewed bread were the low carb diets only, but today we are hearing more and more about giving up all grains, like wheat, in order to be healthier and lose weight. While going gluten free (termed ‘GF’ by those in the know) seems to be the rage these days, there is more to it than a simple diet frenzy. The research that is out there on the forefront about gluten and weight loss was done, for the most part by two doctors: Dr. William Davis and Dr. David Perlmutter. Both of these doctors have best-selling books, ‘Wheat Belly’ and ‘Grain Brain’, respectively and if you take a moment (or two) to read the books, you will see that they are not just about getting rid of bread, or gluten. In fact, both doctors show the research which proves that wheat is in fact doing something to our bodies that is not quite good. Grains, like wheat, actually stimulate the appetite, so if you have ever been hungry 30 minutes after you finished off your bowl of cereal in the morning, it is not just you. In fact, that is what wheat does. So, think about this: If you have bread for lunch, and/or bread for dinner, you actually may be stimulating your appetite, causing overeating and causing that need to snack later in the day. In addition, grains (like those found in breads) raise the blood glucose level quickly because they hit the bloodstream so quickly. In order to stop this spike in the glucose levels, your body will release the hormone insulin. This hormone then drives the glucose from your blood into the muscles (where it can be stored as energy) or the fat cells, where it will be stored as fat. The more carbs you eat, i.e. the more bread in this case, the more insulin is released. Eventually, the muscles become resistant to that insulin storage, and it all goes right into your fat cells. Insulin actually swells the adipose fat cells. What does that mean? It means they get bigger and can hold even more fat. This equals a rise in body fat, and causes you to gain weight. The more carbs you eat, the more your body relies on that instant fat influx to give it energy, so it never gets a chance to actually use the stored energy. As a result that fat storage? Stays in storage, and never gets burned, or used. One main, unifying theme in the ‘no bread’ or ‘gluten free’ diet craze is that carbohydrates equal weight gain, and that is true. We have seen this proven time and time again, from the Atkins Diet to the Paleo Diet. Cutting carbs will help you lose weight. These carbohydrates (which are called complex carbohydrates) include bread, pasta, sugar, white flour, white rice, white potatoes and other starchy, processed foods. There are ‘good carbs’, of course, which include fruits and vegetables, wild rice, nuts, quinoa among others. These types of carbohydrates, called simple carbohydrates are perfectly safe for you, and can be eaten in place of the non-desirable, high sugar, carbs. One of the most important things to take away from the recent ‘gluten-free’ diet craze is that you should be eating healthier. In order to do that, simply shop the perimeter of your grocery store. This will take you through the produce section, the dairy section and the meat section. Be sure to eat more fruits and vegetables, as well as lean meats and low fat dairy products. Also, steer clear of versions of your favorite foods that now say ‘gluten free’. Chances are they have taken out the gluten but added in sugars, salts or other chemicals to give it a better taste. 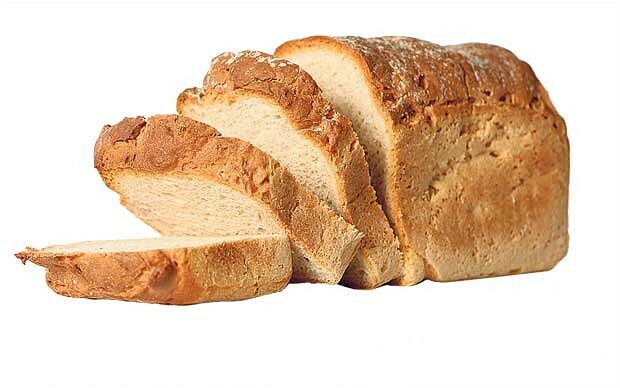 Even gluten free breads are usually laden with preservatives or sugar to give them a taste that is not too awful. Experiment with recipes and perhaps make your own homemade, grain-free bread and baked goods. Almond flour, garbanzo bean flour and even coconut flour are good options in place of wheat or white flours. So yes, bread can cause you to gain weight. While it is not just bread that is making you fat, or causing you to gain weight, it is part of the problem. Cutting out bread and wheat completely, as well as other complex carbohydrates, will have you noticing a change in your waistline almost immediately. In fact, wheat and other gluten-laden foods have been shown to cause our bodies to bloat. So, if you get rid of bread, you might wake up to a less bloated figure, right away. Add simple carbohydrates in place of complex ones, clean out your pantry and design a brand new shopping list. Ditch the bread and fit into a smaller dress size!